This giveaway is now CLOSED. The winner is Katy Morris. Thanks to all who entered. I have a wonderful opportunity for you. 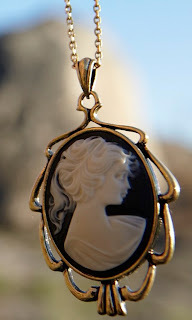 Shabby Apple is giving away this lovely vintage-style cameo necklace through my blog. Isn't it gorgeous? Shabby Apple is an online boutique that makes women feel feminine and pretty with beautiful vintage jewelry and chic accessory pieces along with fashionable, fun , flirty dresses that a woman can wear just as comfortably at family functions, during her workday, or a night on the town. Look how charming this necklace is...The Duchess. Not only are the pieces beautiful, they all have really great fun names. Details: Vintage-style cameo necklace with gold metal setting suspended from 24” long chain. Cameo 40 x 30mm. Go check out their web site at: www.shabbyapple.com, they not only have an enormous vintage-inspired collection of jewelry but fabulous dresses, skirts and pretty blouses. There is something there for everyone! Yay!! The Giveaway Rules: Leave a separate comment for each entry with a contact email address. Like Shabby Apple on Facebook and/or Twitter. Visit Shabby Apple and mention in your comment (on this post) which piece of jewelry is your favorite. Follow me through Google Connect Friends (on right side of page). Grab my button (on the right side of this page) and leave the URL of the blog where posted in your comment. Subscribe to my blog (or on right side of page under "subscribe"). Blog about this giveaway with a link back to my site (be sure to post your link here so I know where to find it)...you can do this on your blog, twitter or Facebook pages. Each post will count as a separate entry. And last, but not least, add it to any social bookmarking site such as Del.icio.us, Digg, StumbleUpon, Reddit, etc., and then paste the URL of the link and a contact email in your comment. Each mention will count as a separate entry. Giveaway ends 2/11. U.S. entries only. my favorite jewelry is "Through the Looking Glass"
I like their Be Mine Valentine Necklace. 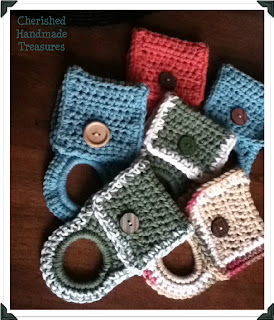 I like Shabby Apple on FB (Karen Hargis Foster) and Twitter (@MommysMoments)and I love the ANUBIS bracelet! I liked them on facebook and I like the 'through the looking glass". 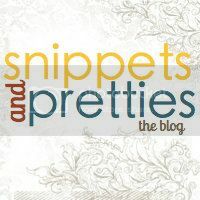 I like shabby apple on facebook and I love the dark secrets of wonderland necklace! I like them on facebook and twitter! I love the mad hatter's time keeper! I follow Shabby Apple on FB & twitter! Love the Sterling Silver Green Earrings. I love their key to wonderland necklace. very pretty! My absolute favorite jewelry item would have to be the Spring Bloom Necklace! My favorite piece of jewelry is Through the Looking Glass. I like Shabby Apple on fb and follow them on Twitter! 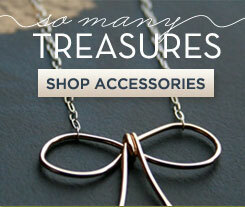 I love the Be Mine Valentine's necklace best but so many nice pieces of jewelry! Thanks! Fb fan of shabby apple and I love the mirage bracelet. I liked you on Twitter as @sophie_burnham. Love the sundrop earrings! I liked the spring bloom necklace. I liked Shabby Apple on Facebook and followed on Twitter. My favorite piece is the Honey Bee necklace. It's gorgeous! I followed you on Networked Blogs. Love the Queen's Rose necklace. And the cameo. I like the Through the Looking Glass. I follow Cherished Handmade Treasures via GFC. I follow Cherished Handmade Treasures via Google +. I follow Cherished Handmade Treasures via Networked Blogs. I like Cherished Handmade Treasures on Facebook. I like them on FB! My name is Jasanna Czellar. I love the Duchess necklace!! I like Shabby Apple on FB as Katy M.
I LOVE their San Remo Ring. So chic! I follow you with Google + as katygmorris. I follow you with Networked Blogs as Katy Morris. I subscribed to your RSS feed with my Google Reader with the email address below. I liked Shappy Apple on FB. and my favorite is everything. i like shabby apple on facebook and i just think the "tree of life earrings" are just so super fun! following with google friend connect!!! I like Shabby Apple on FB as Holly Storm-Burge AND on Twitter as @HollyStormEtsy. My favorite piece is the Through the Looking Glass necklace! Very cool. I love the honey bee necklace!